BAE Systems intends to cut 3,000 of its 40,000 UK jobs. Apparently this is necessary for BAE to "ensure its long-term future" while the futures of the estimated 5,700 directly and indirectly affected workers look bleak. The decision to make 900 out of 1,300 workers redundant at BAE Brough is a body blow to workers in Hull and the Humberside region. Everyone in Hull knows someone who works at Brough. It's particularly disgraceful that nearly 100 apprentices face dismissal. Youth unemployment in Hull is running at around 30%. The £80 million cuts in public expenditure imposed on the council by the Con-Dem government have added hundreds of council workers to the dole queues. Nationally 240,000 public sector workers have been sacked in the past 12 months. The Tories claimed that private industry would 'soak up' those made unemployed from the public sector. The truth is that the private sector on Humberside is shedding jobs, not creating them. So we must act now to save the jobs at Brough. The government stepped in to save the banks. Most people would want to see them save manufacturing industry. BAE made £691 million profit in just the first six months of this year. They paid a 7% dividend to their shareholders. 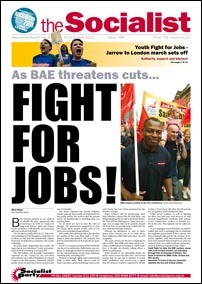 We demand that BAE be nationalised and that all jobs be guaranteed. In 1971, a Tory government led by Ted Heath was forced to nationalise Rolls Royce aero engines. 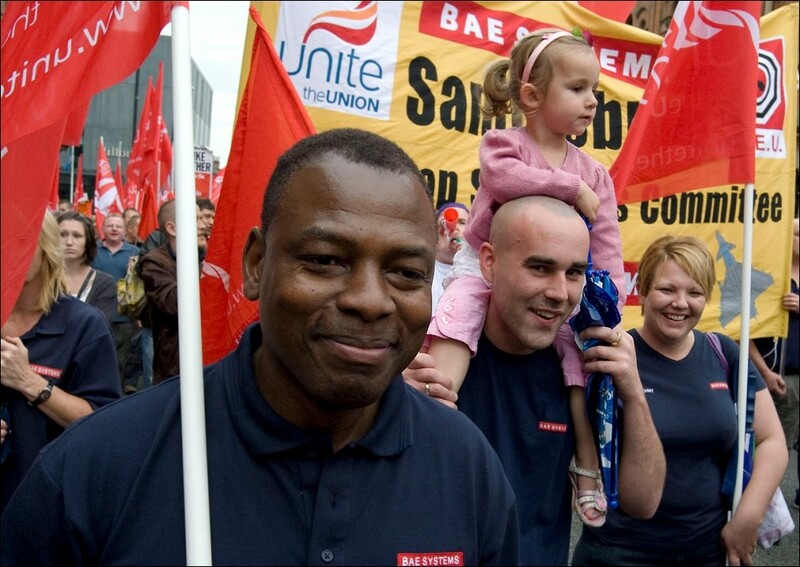 A campaign needs to be developed now for the nationalisation of any large employer shedding jobs, including BAE. Workers at Brough rightly have tremendous pride in their skills. Their talents could be used to produce green technology such as the wind farms that have been promised for the Humber estuary. Many workers will be questioning what Alan Johnson, Labour MP for Hull West, was doing standing side by side with David Davies, the Tory MP for Haltemprice. Their joint message was to argue that local councils should 'do their best' to provide help to find jobs for the redundant Brough workers! Without an alternative to cuts or ideas about what councils can do to resist them, these politicians offer little more than 'tea and sympathy'. The trade unions are the key to fighting for jobs at BAE. The GMB and Unite need to develop a unified plan of resistance. GMB members at Brough are already talking about a lobby of parliament. There should be an immediate ballot for strike action across the BAE sites. This would ensure that no one site is isolated. It would build confidence and would send a signal that the closures would be opposed by 30,000 workers. If necessary the plan should include the occupation of the threatened sites. Public sector workers, as well as fighting for their own jobs and vital services in Hull showed magnificent solidarity with private sector construction workers at Saltend earlier in the year. That support can be called on again. As we campaign to save BAE jobs, we need to realise that such a campaign has to challenge the capitalist system itself. If the economy was democratically planned by the workers in industry together with democratically elected local and national representatives as part of a national plan, we could eradicate unemployment and the uncertainty we face today. Youth Fight for Jobs, the BAE workers, along with local council workers, are marching through Hull on Saturday 8 October. The demo is backed by GMB, Unite, Unison and NUT locally. Assemble 12 noon at the war memorial opposite the bus and railway station.